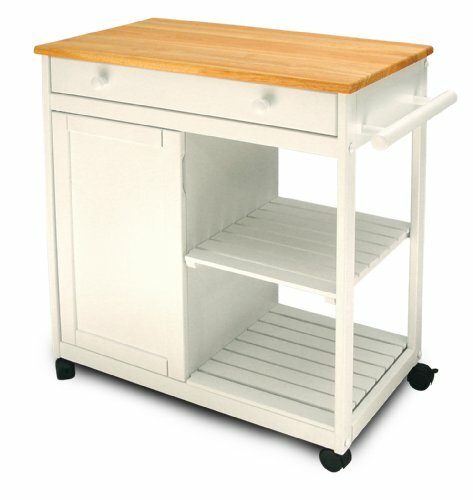 Home Styles Kitchen Cart with Stainless Steel top features a solid wood construction in natural finish, two easy open utility drawers on metal glides with brushed steel hardware and adjustable slotted middle shelf can also be used as a wine rack, solid bottom shelf, brushed steel towel holder and Heavy duty locking rubber casters. Size is 44-inch width by 20.5-inch depth by 36-inch height. 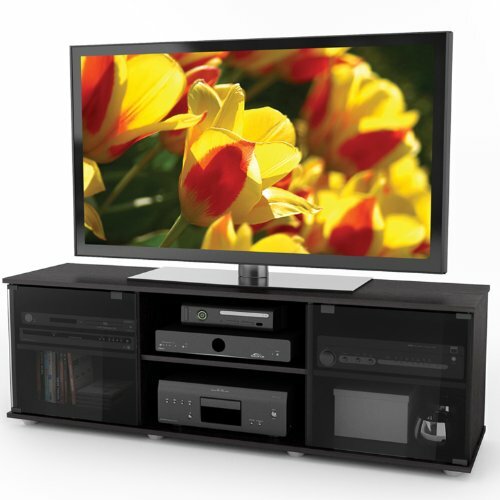 The Tech-Craft Veneto Series creates sturdy and stylish stands for large, flat panel TVs. 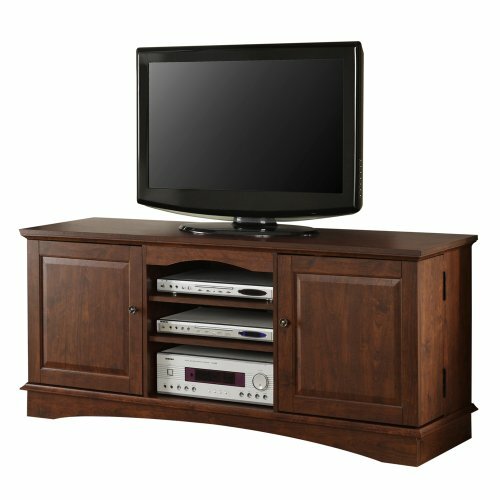 These easy-to-assemble pieces are made of high-quality wood, and are available in a chic wood veneer finishes. 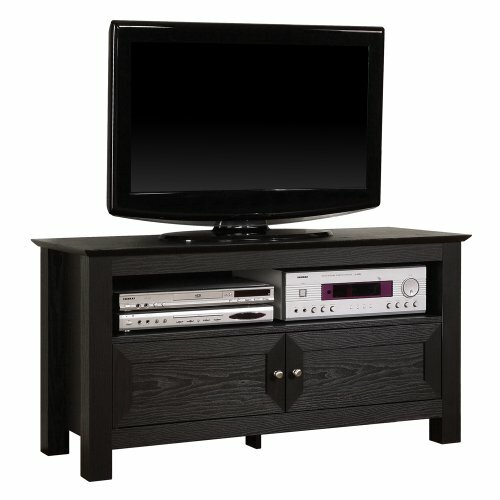 This stand allows for ample component storage, featuring a center channel storage compartment. The napa kitchen center with its clean style and natural finish provides culinary function to any kitchen. It features a solid wood top, spice and condiment caddy, towel bar and paper towel holder. 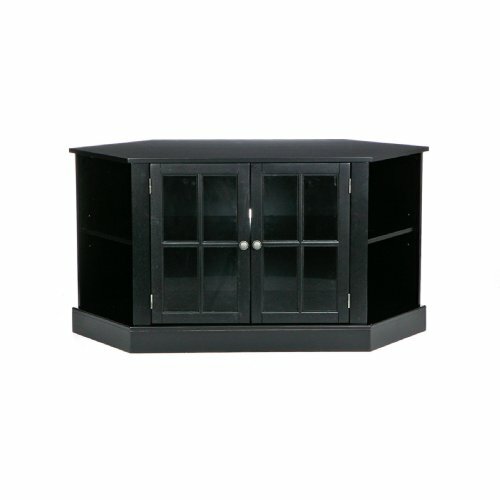 for storage needs the card offers both convenient open storage with fixed shelving and neat concealed storage with two utility drawers and two cabinets, each having an adjustable shelf. Heavy duty locking casters provides even greater utility. 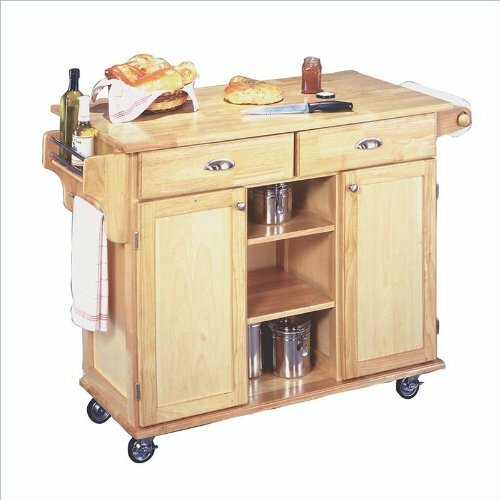 The cart is constructed from sustainable hardwood and protected by a clear coat finish helping to guard against marring from normal use. Assembly required. Measures 49-3/4-inch width by 24-inch depth by 35-1/4-inch height. 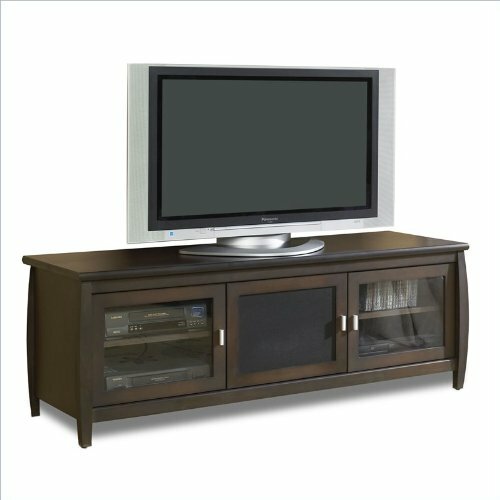 This stylish plasma TV stand offers ample storage for DVDs, VHS tapes and CDs, room for your electronic components as well as a unique, effective cable management system that makes it easy to get at your components once the TV stand is in place. Simply slide the rear panels open or closed if any changes are needed. Five legs provide a solid base and adjust in height to compensate for uneven floors. Legs and handles in brushed metal are a complement to the black finish. 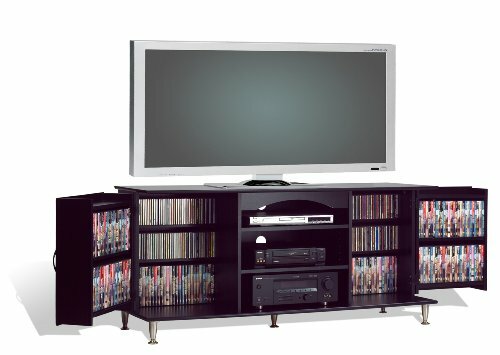 Holds plasma / LCD TVs up to 60¿. Stores 462 CDs, 212 DVDs, 120 videos or any combination of the above. 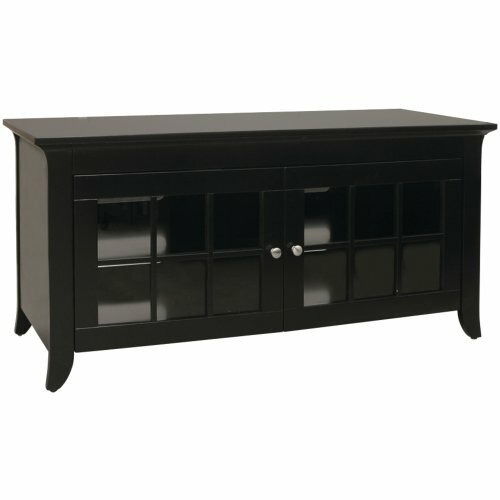 Elegance and function combine to give this contemporary wood TV console a striking appearance. The design gives a stylish, modern look crafted with durable laminate and MDF board. Console will accommodate most flat-screen TVs up to 65-Inch with three levels of center shelving to provide ample space for A/V components. The interior doors hold approximately 180 DVDs, Blue-ray discs or other media. 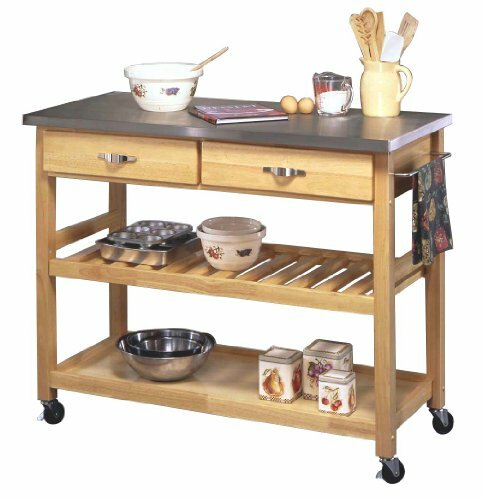 Stainless steel top kitchen cart with breakfast bar. 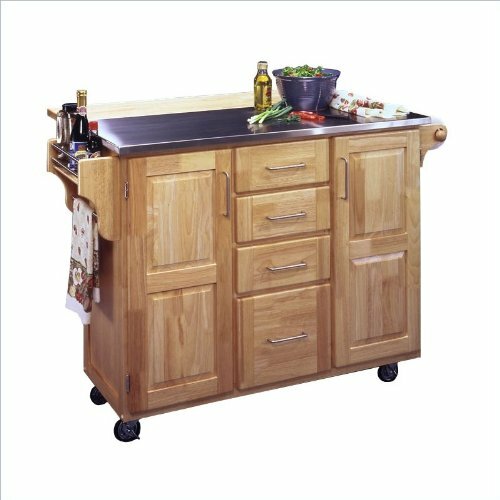 It features a stainless steel work surface making clean-up easy, a wood drop-down breakfast bar for extra space when needed and heavy duty locking casters for convenient mobility. Get lots of extra storage with four utility drawers and two cabinets, each having an adjustable shelf. for added convenience the cart also features a spice and condiment caddy, towel bar and paper towel holder. The natural finished cabinet is constructed from sustainable hardwood with a clear coat finish helping to protect against marring from normal use. Brushed nickel hardware with a slim profile coordinate nicely with the finish. Assembly required. Measures 52-1/2-inch width by 19-1/4-inch depth by 36-inch height.